But the cause for my singing this week lay in knowing that our RV was getting repaired. While I show the kids the bright lights of the big city, the fifth-wheel axle would be made new. After sitting sidelined in tiny-town, CA for ten nights awaiting RV parts, we decided to forge ahead without the rig. Can you smell the fresh seafood? 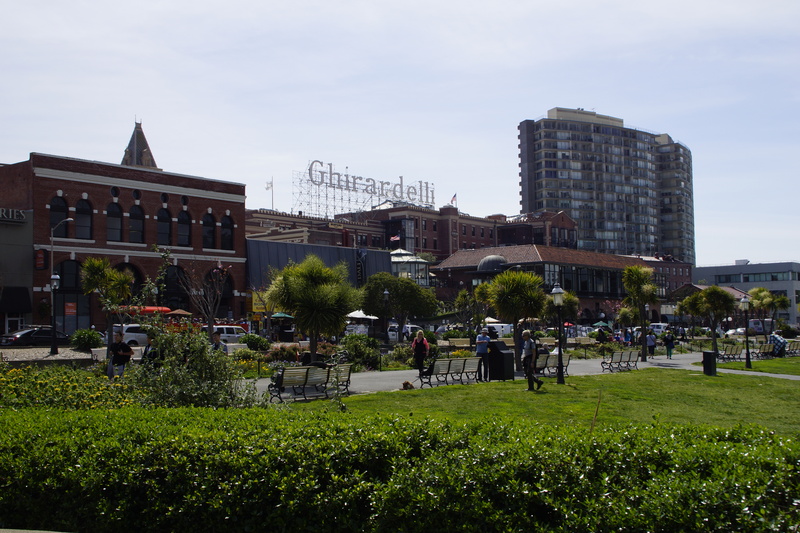 We booked a pet-friendly hotel near Fisherman’s Wharf and took our Maltese and Yorkie to the concrete jungle with us. Close proximity to tourist sites allows the kids and I to walk the streets of San Fran while John drives to make sales calls to his customers. 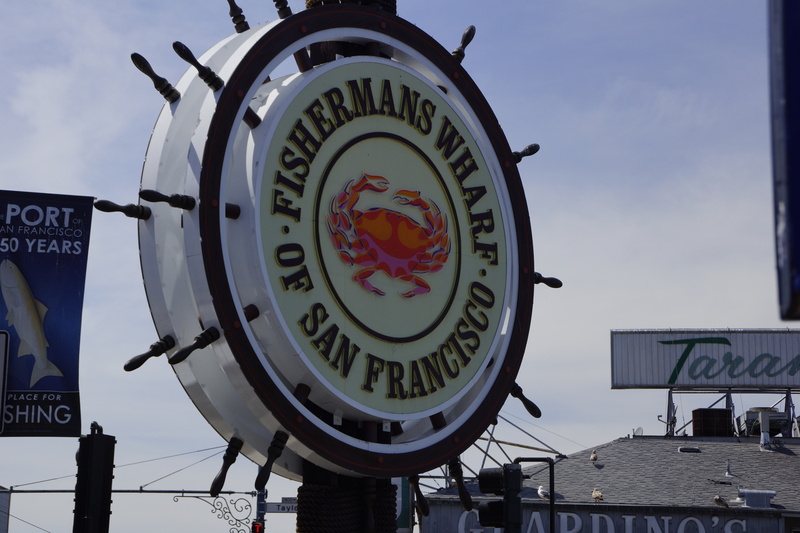 Three full days in the city to discover all the San Francisco treats. Yes, there will be singing. I’ll never forget my first trip to the Golden Gate city. My younger brother, Bret, was stationed in San Jose at the Navy base after his basic training in Illinois. My parents planned a trip out to see him and invited me to come along. It was not only my first time to visit the Bay area but also my first trip away from my freshly potty-trained three year-old son. It didn’t take much coaxing for me to say yes. After a brief Navy base visit, my brother enjoyed his earned ‘leave’ with us. 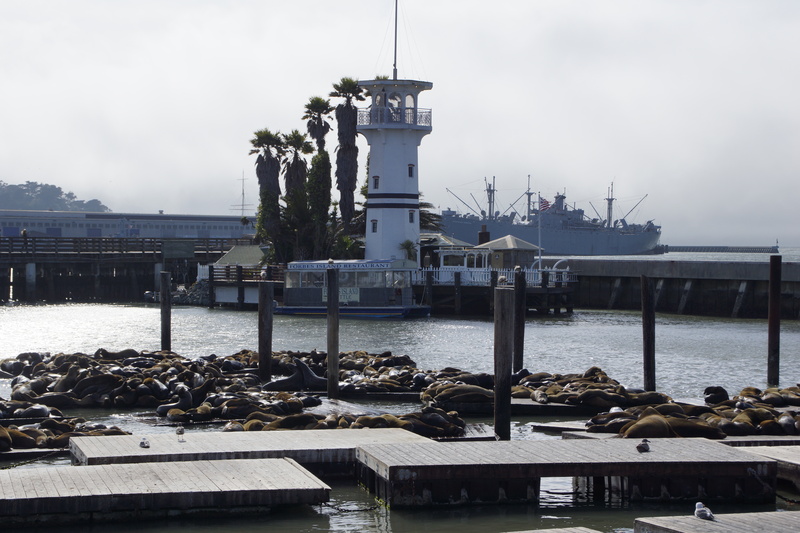 We wandered around the Wharf, ate clam chowder in Boudin sourdough bread bowls, nibbled on Ghiradelli chocolates, rode the cable car, and, of course, stood along windy Pier 39 watching the sea lions fight each other for sleeping space on the sunny, floating boat docks and listening to their never-ending barking. But my favorite memory from that trip was when we drove across the Bay Bridge to Treasure Island listening to Dad retell his story of getting stationed there as a young man enlisting in the Navy. Then and each time since, he tells the story with the same nervous excitement he felt at 19 years old. 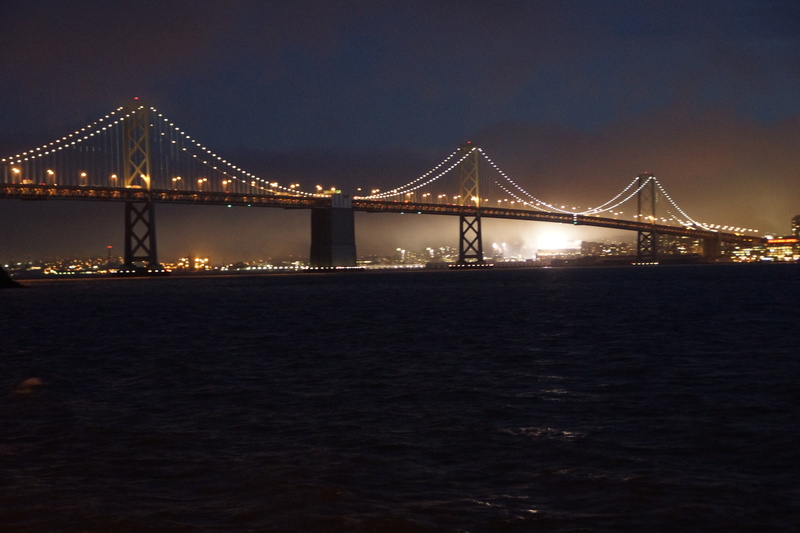 Driving across the Bay Bridge brings back the salty smells, the crisp air, and the uncertainty of the moment for him. Now here, in this moment, I couldn’t help but take the family to Boudin for our first dinner together in San Francisco. Sitting outside on a brisk April evening listening to jazz sounds fill the air from local street musicians. Watching pigeons clamor for bakery crumbs along the damp wharf cobbles. Savoring warm soup and sour bread elicits a head turn toward Treasure Island in the distance. Retelling not just Dad’s story but mine, my memories of the city, to my kids. I took the kids to the very places my parents took me as a young woman. I toured the city again as though I’d never seen it before. Back to Pier 39 and the barking sea lions, back to the rich chocolate smells of Ghiradelli, and back to Treasure Island for spectacular views of the city from across the Bay Bridge. 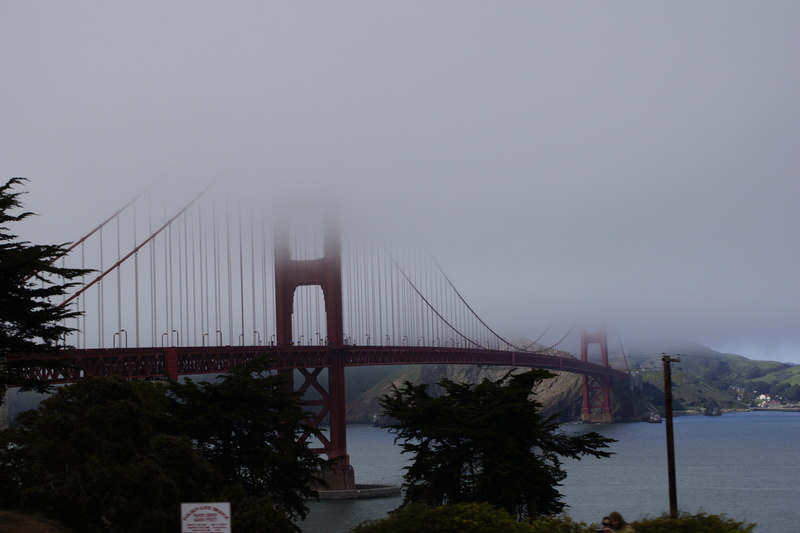 Oh and then there’s that ‘international orange’ bridge that peeks out from the fog every so often. The Golden Gate Bridge, the most photographed icon of the city when it’s not covered by thick fog. The kids thought it was simply a mirage until we drove across it. A crossing well worth the time as Sausalito awaits your arrival on the other side. Ten degrees warmer and ten thousand fewer people to contend with cause envy from across the Bay. 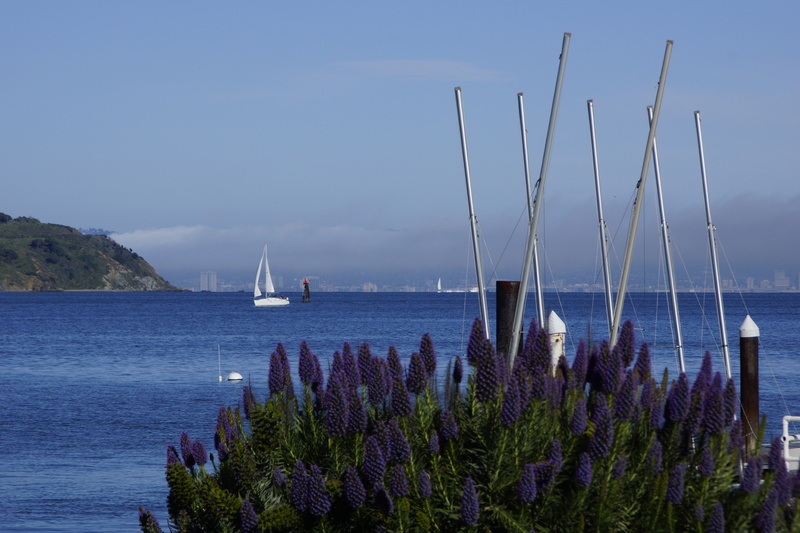 Warm and sunny Sausalito. Foggy San Fran in the distance. 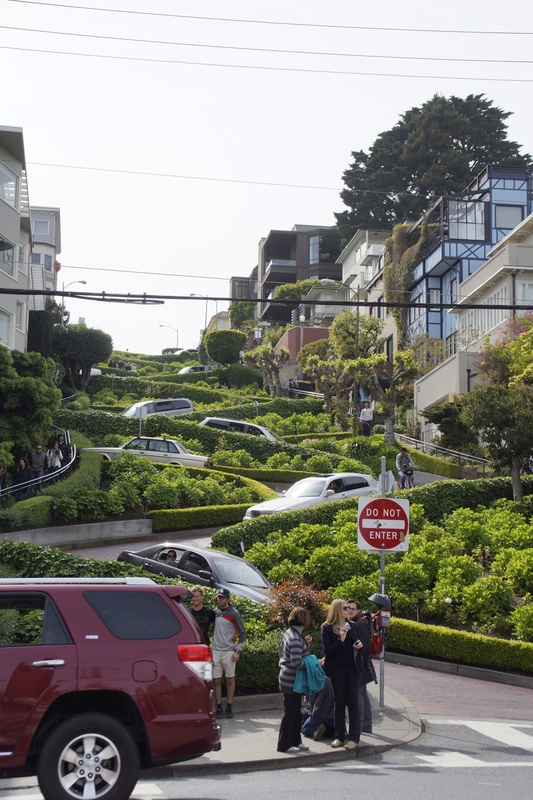 No trip to San Fran is complete without a trip down Lombard Street, the famously crooked street. The kids and I hiked up its straighter southern sister and then walked down the winding steps of the golden child. We gawked at the narrow garage entrances and hedge-lined red brick street. And we gawked at the views from the top: views of bridges, water, ocean liners, Alcatraz, and people, and cars, and a city worth singing about. I’ve been to San Fran more than five times now and appreciate her more each time. It’s not a city I hope to live in. It’s not my favorite climate. It’s big and busy and congested. But I am hoping that this one-time introduction will carve impressions on my kids’ lives that carry them back to this place with their families one day. And enjoy a warm soup and sour bread and retell the stories that have been passed down, as well as their own. 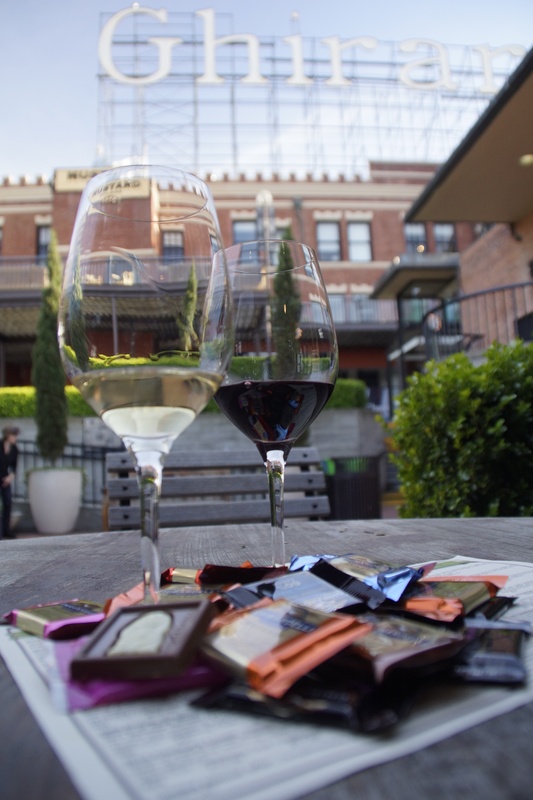 Next Stop: Napa…with or without the RV. 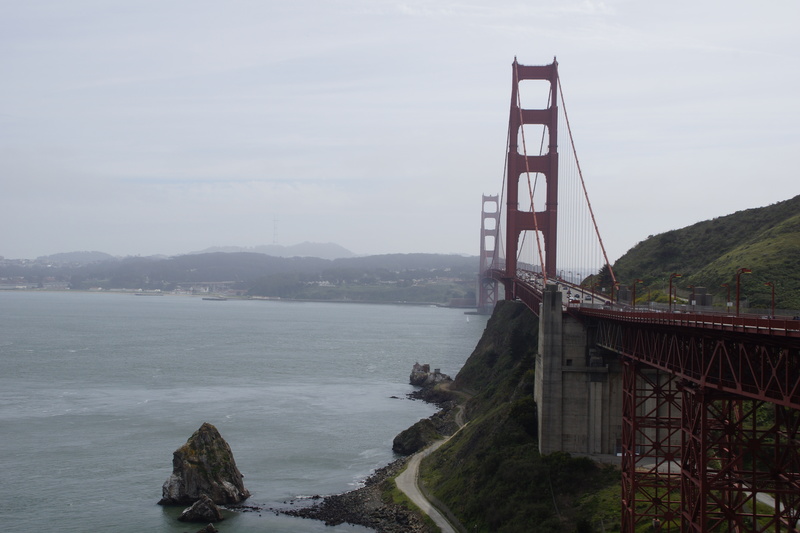 This entry was posted in Fifth-Wheel, Parenting, Purpose, RV, RVing, Travel and tagged California, homeschooling journey, purpose, RV, San Francisco, travel by Natalie Lewis. Bookmark the permalink. Thanks Dad! You created my first memories in that city. Love you.